You are here: Home / News / The Cuckfield Cosmos boys have done it again! The Cuckfield Cosmos boys have done it again! 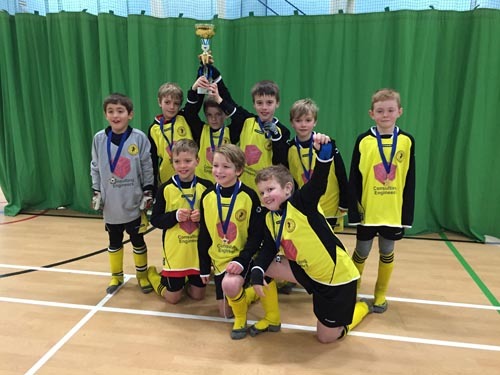 They have participated in the finals of the 3G Tournament at Downland’s Sports Centre, Hassocks on Sunday 21st December, playing six matches and have come first place winning a very large trophy and a medal each. Mr. Bye, Club Welfare officer for Cuckfield Cosmos FC http://www.cuckfieldcosmosfc.co.uk/ presented the trophy and congratulated and praised the players, coaches and parents for such a great event. The boys head coach Mr. Simmonds said that “the final result was testament to how far teamwork, determination and taking the advice of the coaches can get you”. At BSE 3D we are of course very proud of them all.